Pain in the back area is a common problem for many people, regardless of age or occupation. The best foam roller for back issues will help to alleviate pain and tension in this area by releasing the myofascial tissue and tight muscles in both the back and other parts of the body. Beneficial foam roller for back area. High-quality and recyclable foam product. Two different levels of density combine for effective results. High-density, molded and durable product. Good for targeting smaller areas of the body. Available in two different lengths. Includes free carry bag and one-year warranty. A foam roller is a lightweight, tubular shaped piece of dense foam, which works as a self-massaging device. When you place a certain area of your body on it, it applies pressure against your bodyweight which helps to release tight muscles and myofascial tissue. It can be used on many areas of the body, and can be used as a tool to stretch muscles as well. Foam rollers can be used by people of all ages and activity levels. They assist in releasing the fascia of the body. Fascia is a mesh-like system of connective tissue which supports the internal organs of the body and links the whole muscular system. Fascia can become tense for a variety of reasons. These include a sudden injury or fall, overuse during a certain activity, or simply bad posture or inactivity over a period of time. You may not even notice tight fascia initially, but eventually it can reduce movement and lead to pain in the same area, or elsewhere in the body. For more on the benefits of foam rolling, see here. How Do I Choose the Best Foam Roller for My Back? There are a huge variety of foam rollers on the market, in a range of densities, sizes and textures. The first step in choosing the best foam roller for your back is to consult with a medical or fitness professional. They’ll be able to advise you on the correct size, density and texture for your back issue, as well as the best techniques and exercises to do. The density of a foam roller is either low, medium or high, and if you’ve never used one before it’s generally considered best to start with a low-density foam roller and increase the density as your pain threshold increases. If you’re an active person and your muscles are used to release from techniques such as massage, you’ll probably be better off with a foam roller of medium to high density. Foam rollers can be purchased in a long size which is generally around 36 inches. This size is not only the most stable size, but also ideal for back issues given its length. Foam rollers are also available in a medium length, around 24 inches, or small length of about 12 inches. The medium and small sizes are generally better for smaller areas, such as calves and arms, or for those who like to take their foam rollers with them when they travel. The texture of a foam roller is the final feature to consider, and they’re available as either smooth rollers, or textured with ridges and knobs. If you haven’t used a foam roller before, it’s generally best to start with a smooth roller, as the pressure is even and less intense. The ridges and knobs on the textured foam rollers help to mimic pressure applied by a masseuse, so they’re preferable if you’re wanting a more targeted, higher pressure massage on your muscles and fascia tissue. What Is the Best Way to Use a Foam Roller? There are numerous ways to use all types of foam roller, and numerous YouTube videos and online tutorials providing instruction on this. However, it’s always best to consult with a medical or fitness professional if you’ve never used one before, or if you have a particular issue in an area of your body. They’ll be able to give you the best exercises for your body and any issues you may have. 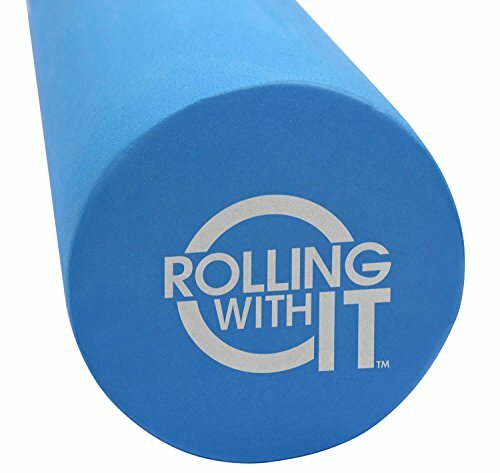 Generally the most effective foam rolling techniques involve putting the roller on the floor and placing a certain part of your body on top of it. After allowing your bodyweight to release onto the roller, you can then gently roll the affected area over the foam, adjusting your bodyweight to increase or decrease pressure as necessary. What Are the Features and Benefits of a Foam Roller? As previously mentioned, foam rollers are available in a range of densities, sizes and textures. Denser rollers provide more intense pressure, and are more durable for long-term use. Softer rollers tend to lose their shape over time with repeated use. While longer rollers are preferable for larger areas of the body such as your back, they’re also a lot bulkier and cumbersome to transport, and hard to use in small areas. Smooth foam rollers tend to be both cheaper and more versatile for use on different areas of the body, as they provide an even pressure, yet textured rollers can provide a more intense pressure on tight spots and knots in muscles. What Is the Best Foam Roller for Back? With so many foam rollers available, and so many features to consider, choosing the best foam roller for back issues is certainly challenging. We’ve selected five popular foam rollers and evaluated each of them for you on quality, price and benefits. This roller is made from molded polypropylene foam, and features a 2-pounds-per-cubic-foot density, which ensures it won’t lose its shape even with heavy usage. The roller’s smooth surface and 6-inch diameter ensures even pressure when used on any area of the body, and four size lengths are available ranging from 12 inches to 36 inches. This foam roller is made in the U.S. and comes with a free online instructional video and a full three-year limited warranty. This extra firm foam roller helps to relieve muscle tension, provide reflexology to the muscles and prevent injury through myofascial release. It’s a beneficial tool for physical therapy, and can also be used for stretching, strengthening, core and spinal stabilisation, improving balance, and re-educating postural muscles to prevent further issues. This deep tissue foam roller is particularly effective for the back area and IT band, and can be used before or after exercise. Roller slips on some surfaces. Speckles can catch on hair and clothing. Made from eco-friendly, professional-grade Eva foam, these foam rollers won’t chip, flake or lose shape, even with heavy usage. While the interior of these rollers is extremely dense and firm, the exterior is made of a softer non-porous foam, which results in the perfect combination of density with some give in it. Three sizes are available; 13-inch travel size, 18-inch lower body size, and the 36-inch size which is the most popular. Recommended by medical and fitness professionals as one of the safest tools for physical therapy, this foam roller is particularly beneficial for back and neck pain, leg muscles and IT bands, stamina, balance and core stabilization. It functions as a deep tissue self-massager, and releases the myofascial tissues for rapid muscle recovery and repair. It can improve the flexibility and mobility of muscles, as well as providing immediate and lasting relief for tense and painful muscles. It can be used by anyone, from crossfitters and weight trainers to runners and yogis, no matter the intensity of their exercise schedule. Good combination of density and give. Some rollers were found to have poor workmanship. This foam roller is made from high-density polypropylene foam, which provides sufficient density whilst being supportive enough for all body types, and features moulded edges for a smooth rolling surface. It keeps its shape, even with heavy use, and is lightweight and compact. 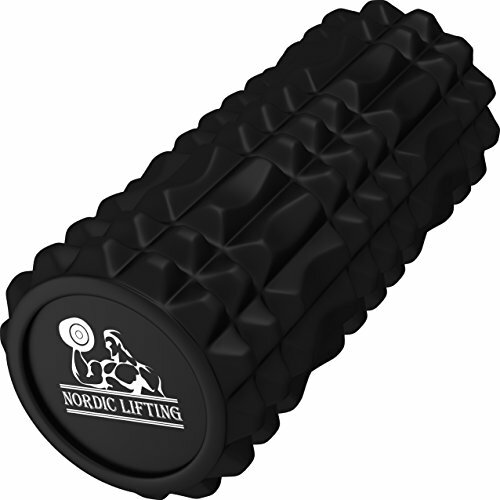 This roller is ideal for using during strengthening, rehabilitation, core, balance and flexibility exercises. It’s designed to alleviate sore muscles and can be used before, during or after a workout. The roller utilises pressure from your bodyweight to increase circulation to fascia tissue, and the pressure on muscular trigger points can improve the range of motion, flexibility and alleviate pain. Too dense for back area. Roller slips on many surfaces. 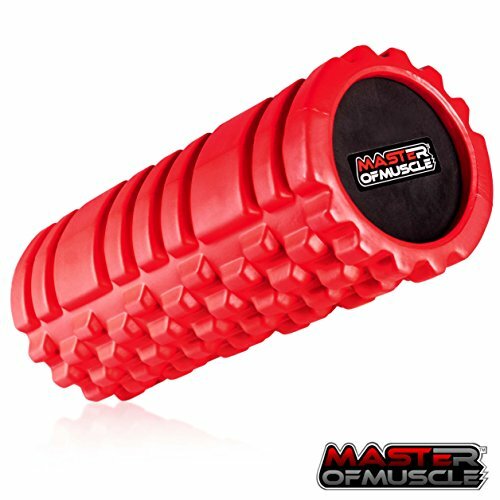 This compact, textured foam roller is lightweight and portable, and the small size enables the user to target smaller regions and corresponding muscle groups. It’s possible to utilise the pressure from the textured surface to target specific areas, which provides relief from muscle soreness. This roller comes with a free downloadable ebook with exercises and instruction from a trainer. This foam roller massages soft tissue, and this action has a range of benefits including the breaking down of scar tissue, relaxing tight muscles, improved mobility and flexibility. It can aid with injury prevention and rehabilitation, facilitate the releasing of toxins pre workout, and quicken recovery post workout. Textured surface for added pressure. Central cylinder prone to breaking. Only one small size available. Too much gap between the different textures. Made from high-grade, recyclable EVA, these foam rollers are manufactured to handle weights of up to 500 pounds. The unique, ergonomic design features textured pressure areas, which mimic the movements and give the effect of a deep tissue massage. Two sizes are available, 13 inches and 16 inches, and the roller comes with a free carry bag and one-year warranty. 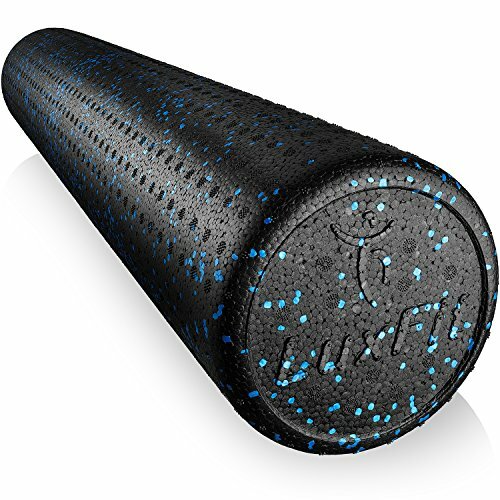 This foam roller has a textured surface which targets trigger points and applies pressure in precise areas. This helps to alleviate muscle tension and joint stiffness through release of the myofascial tissue, which in turn increases the flow of oxygen to the muscles and can aid in a faster recovery. Using this foam roller is beneficial for rehabilitating injuries and preventing further damage, and it’s particularly effective for back and muscle pain, sciatica and plantar fasciitis. The features of this foam roller mean it can be used in a number of ways, including stretching of the muscles to increase flexibility, and myofascial release through self massage and deep tissue trigger. It can be used by beginners through to experienced athletes, and is beneficial to gym goers, weightlifters, yogis, crossfitters and those who partake in any sports for exercise and training. Although there are many effective foam rollers on the market, in our opinion the best foam roller for back issues is the Lux Fit Speckled Foam Roller for Muscles. This foam roller has a smooth surface, which makes it more versatile with the resulting even pressure, and a better choice for first time or inexperienced users. The two textured rollers we evaluated, Master of Muscle Foam Roller and Nordic Lifting Foam Roller, both had issues with durability and were also found to be too dense for effective use on the back area. The Lux Fit Speckled Foam Roller for Muscles is also able to be purchased in four sizes, has the largest range of all the products we evaluated, and was found to be of the most cost-effective foam rollers available. The density of the foam was found to be particularly beneficial for the back area, unlike the Amazon Basics High-Density Round Foam Roller which was too dense, and the Rolling With It Foam Roller had some workmanship issues which affected the durability of the product. The Lux Fit Speckled Foam Roller for Muscles comes with a free online instructional video, and is also the only product which comes with a full three-year limited warranty. In our opinion, the combination of effectiveness on the back area, durability, versatility, range of lengths available and cost effectiveness means that this product is the best foam roller for back issues on the market. What is the Best Plantar Fasciitis Night Splints in 2019?